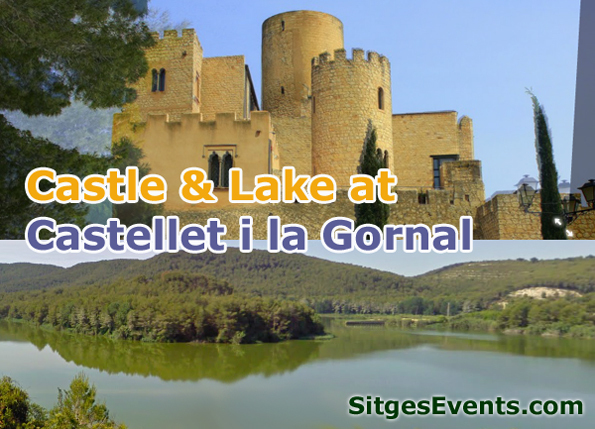 Castellet i la Gornal is a municipality in the comarca of the Alt Penedès in Catalonia, Spain. It is situated in the valley of the Foix river at the point where it crosses the Coastal Range. The river is dammed to form the Foix reservoir. The ajuntament (town hall) is in La Gornal. The municipality is served by the N-340 road, and by a local road to Vilanova i la Geltrú. The main access road to town is the National Highway 340 (Junquera – Cadiz), crosses the town from northeast to southwest through the middle of the town of Gornal. From Barcelona or the A7 and out for ‘Vilafranca del Penedès’ or ‘Santa Margarida i els Monjos’, incorporated into the N-340 towards ‘El Vendrell’. From Tarragona or the A7 and exit at ‘El Vendrell’, and joining the N-340 towards Barcelona. RENFE can reach the station of ‘l’estació de l’Arboç’ on the suburban line via the C4. The Arboç is 1 km Gornal and 2km from Castle.